Leam Richardson admitted Wigan Athletic’s 1-0 victory over Rotherham proved the squad is equipped for the demands of the Championship. Latics huffed and puffed but couldn’t quite blow down the determined Rotherham rearguard for the first hour. 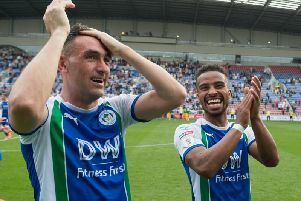 But after the introduction off the bench of James Vaughan and Callum McManaman - for prize assets Will Grigg and Nick Powell - Latics finally got the breakthrough their overall efforts warranted. The only goal came on 73 minutes after a vicious shot from McManaman was parried by Millers goalkeeper Marek Rodak into the path of Vaughan, who toed the ball home, to send Latics up into eighth spot going into the international break. “Squads are key in this game - very rarely do you win a league, or do anything worthy, with 11 players,” acknowledged the Wigan assistant boss, sent out for media duties by Paul Cook. “Today, Griggy and Powelly took the knocks early on, and Vaughan and McManaman went on and took the plaudits. “But the great thing was after the game everyone was in there high-fiving, celebrating with each other. “And as long as you’ve got a happy, vibrant squad, working for each other, you’ll be okay. “It was certainly a hard-fought victory. “Rotherham made us work tirelessly for it, I thought we dominated the game repetitively - in a good way - but the goal just wouldn’t come. “You’re conscious that Rotherham will ask you questions at some stage, because they’re a good side with a very good management team. “But our lads dug in and we really earned the win. The Wigan players will now have a fortnight to bask in the glory of lying just four points off the top of the Championship. “I think a few of them will be happy with that, it’s been a very hectic start to the Championship,” recognised Richardson. Richardson also played a trademark straight bat to questions about the fitness of Grigg and Powell, who were both substituted on the hour mark. “We’ll assess that tomorrow, they’ve obviously both had a lot of games in a short period of time,” he added.